The Madeleine is a stylish, lightweight and slim fitting jersey in a premium stretch fabric that will keep you cool whilst looking great. The striking Madeleine Polka Stripe earns its spots with the perfect mix of stylish and technical. Featuring moisture wicking fabric to keep you coolon hot days with a full length zip for extra climate control, the Madeleine performs as well as it looks. 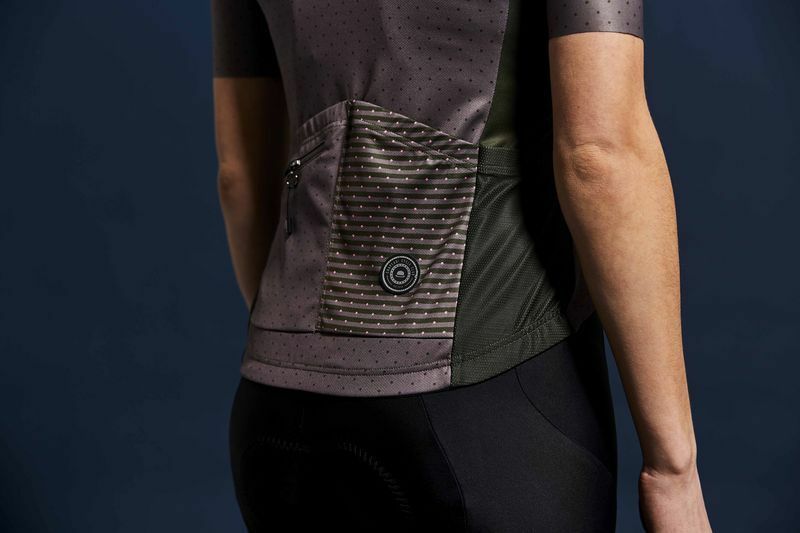 Featuring two full-sized pockets, ideal for essential tools and food with enough room to store your arm warmers and gilet as rides hot up. An extra zip pocket is the perfect place to keep valuables safe. With essential reflective trim and Chapeau! badge you’ll be seen even as the sun sets on another adventure. Get your polka face on and stand out from the crown, wear it when its hot and add arm warmers when its cooler. This is Elise, she is wearing an Extra Small Madeleine Polka Stripe Jersey, Extra Small Soulor Bibshorts and our Tall Club socks.